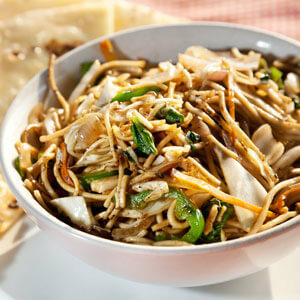 An Exceptional Cuisine- Chapati Noodles! A healthy recipe and a healthier substitute, Chapati Noodles can be served to kids and even packed in their tiffins, loaded with vegetables and shredded chapatis. This seems to be the salubrious form of fast food taste. Stack the chapattis and cut them into 4 quarters and then into long thin strips. Heat a pan with oil and add crushed garlic first followed by onion and green chilies. Fry for a minute and then add the vegetables – carrot, cabbage and capsicum and stir fry them. Lower the flame. Add the sauces, pepper powder, chilli powder, and a little salt. Stir well and add the cut strips of chapati and toss well on high flame to mix thoroughly. Garnish with finely chopped coriander, spring onion and squeeze some lime juice and serve immediately.